Hello! My name is Jasmin and I’m a student from the UK ( I’m a long way from home!). 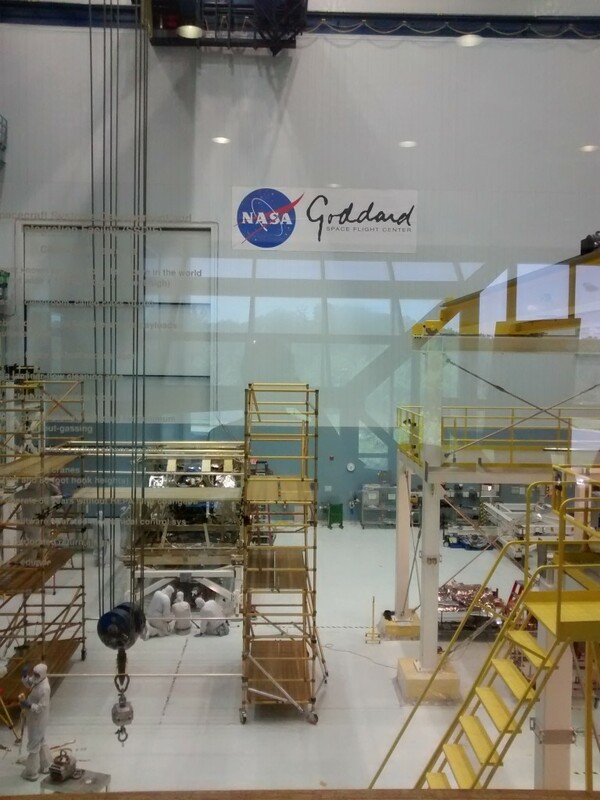 I am spending a week here at Goddard, working with the Blueshift team, learning about the outreach and education side of things and trying to take in all of the awesome that is NASA Goddard. First up was a tour of the facility. We started with the Thermal Systems Support unit, where the insulation for spacecraft is made and crafted. There is a basket of samples, each with the mission they were made for written on, hanging on a door in the middle of a corridor that you can actually pick up and compare with the others, and see all of the different layers that make up the vital insulation needed to protect the instruments in space. Next we moved on past a lot of clean tents, where positive pressure is created inside by air blown in from the top, to ensure the dust particles are flushed out to provide the optimum environment for building and testing instruments that will go into space. After we passed these, we arrived at the Space Environment Simulator Test Facility, which is a high vacuum chamber capable of simulating a variety of different thermal conditions like those the James Webb Space Telescope (JWST), which is currently under construction at Goddard, will be exposed to in space. The photo above gives you an idea of just how huge the chamber is – and that is only the bit on the first floor! It extends downstairs and down again, with pipes and valves of all shapes and sizes in crazy formations spiraling out from the inside. 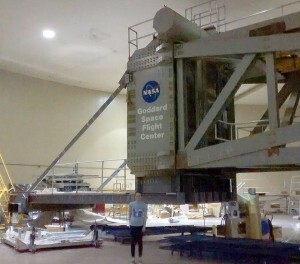 When a spacecraft is launched into space on top of a rocket, it is a bit of a bumpy ride (a lot of a bumpy ride) so there are both acoustic and vibration test chambers at Goddard, to make sure the instruments are not going to be damaged before they even reach their destination. 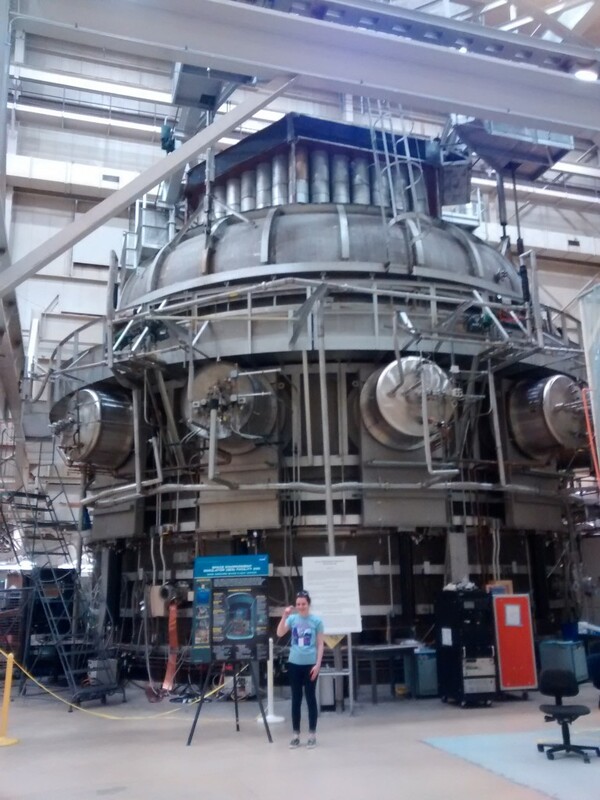 The doors of these chambers are very thick and are two floors high, with huge bass speakers in the acoustic chambers that look like giant horns to thoroughly test spacecraft with two minute blasts. The vibration chambers have a table inside, which the spacecraft sits on and is shaken up every which way to simulate its launch into space. The centrifuge at Goddard is a huge 120 feet in diameter! It uses so much power that it is currently a bit of a storage facility as it can’t be switched on all of the time. However, it is so cool! The payload sitting opposite the counter weight can be accelerated up to a neck breaking 30Gs! The James Webb Space Telescope is due to be launched in 2018. It sees in the infrared wavelength and has a huge 6.5 meter primary mirror in a honeycomb structure, made of 18 separate segments. It is being built in the class 10,000 clean room, and the vibration and acoustic test chambers will soon be testing the components. I got to watch as one of the instruments was being tested and tweaked in the clean room, and prepared for its journey to the chambers. So that was my first day, I met some very lovely people and saw some amazing things. I’m really excited about what is still to come!